Psoriasis is a skin condition characterized by inflamed, red, raised areas that often develop on skin with silvery scales. Psoriasis is a persistent, long-lasting or chronic disease with periods of improvement and exacerbation. Generally seen between 20 to 50 years of age. Often associated with a positive family history of Psoriasis. It can affect any area of the body, the most common being, the scalp, elbows, knees, back, nails, palms and soles. The exact cause of psoriasis is still unknown. It affects the life cycle of skin cells. Psoriasis causes cells to build up rapidly on the surface of the skin resulting in abnormal fast-growing and shedding of skin cells. Psoriasis is not contagious. Thus you cannot get psoriasis by swimming in the same pool or by eating from the same plate. Certain medications – including lithium, which is prescribed for bipolar disorder; high blood pressure medications such as beta blockers; anti-malarial drugs and iodides. itching is a reasonably common symptom especially in scalp and anogenital area. symptoms of psoriasis. However, these could vary depending on the form and severity of the disease. Psoriasis can be seen anywhere over body, more commonly over elbows, knees, trunk, arms, legs and scalp. Pitting of nail plate and abnormal nail growth. Discolouration and yellow-brown spots under the nail plate. With the development of silvery shiny scales, the physician can usually diagnose psoriasis with a medical examination of the nails and skin. A skin biopsy also helps in the confirmation of the diagnosis. 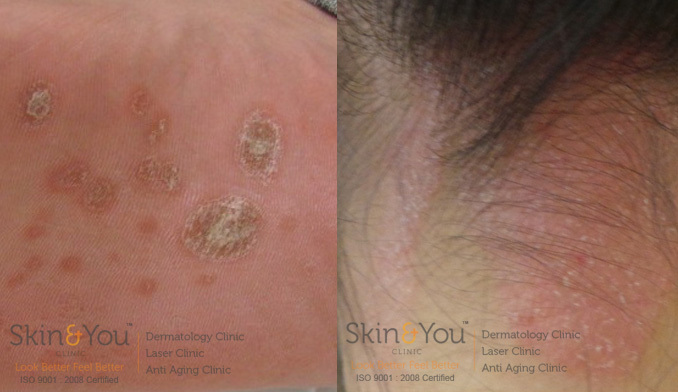 Treatment at skin and you clinic for psoriasis ? At the present time, there is no cure for psoriasis. Thus, the goal of treatment is to reduce inflammation and slow down the rapid growth and shedding of skin cells. Moisturisers reduce itching and scaling and can help combat the dryness. Vitamin D cream slows down the growth of skin cells. Cortisone (Steroid containing) creams slow skin cell turnover, reduce inflammation and relieve associated itching. They should strictly be used under the advice of a dermatologist as they have associate adverse effects. Light therapy (Phototherapy) – This involves exposing your skin to controlled amounts of the artificial UV-A or UV-B light. It slows skin cell turnover and reduces scaling and inflammation. Oral medications – In case of severe psoriasis or the resistant types, the dermatologist may prescribe oral or injectable drugs, such as methotrexate, cyclosporine, oralretinoid, etc. Why Skin & You Clinic for Psoriasis? We, at Skin and You Clinic, aim at controlling your disease progression and to make you aware of all the factors in your routine life which could predispose for recurrences. Through proper counselling we suggest individualised dietary and lifestyle changes so it is easier to incorporate in your daily life and have a long term control of your condition.